Govt. Kirti College, Nial Patran invites candidates for various Guest Faculty posts to fill 02 vacancies on Contractual basis. 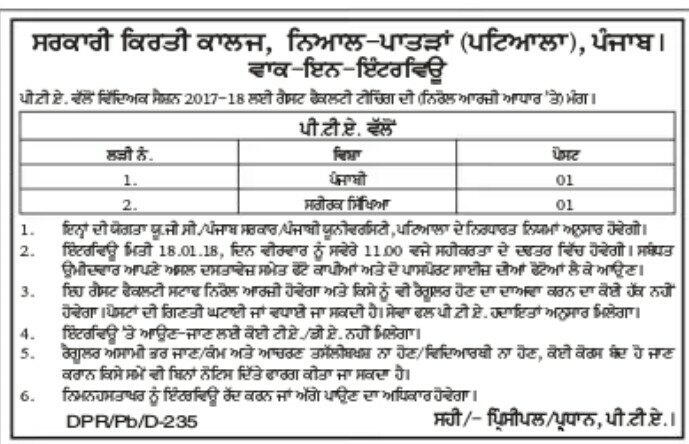 All eligible candidate should appear for walk-in Interview on 18.01.2018 at 11:00 am. Check the eligibility criteria, selection procedure, job description & other details given below. Eligible candidates should appear for walk-in Interview on 18.01.2018 at 11:00 am along with original documents & their xerox copies & 2 passport size latest photographs. No TA/DA will given for interview. Ensure your eligibility before interview.